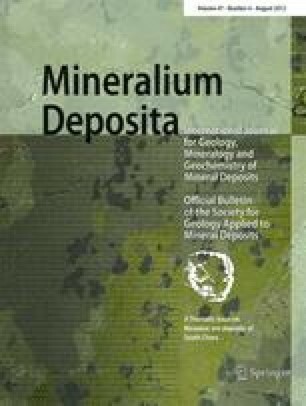 Vein-type tin mineralization in the Dadoushan deposit, Laochang ore field, Gejiu district, SW China, is predominantly hosted in Triassic carbonate rocks (Gejiu Formation) over cupolas of the unexposed Laochang equigranular granite intrusion. The most common vein mineral is tourmaline, accompanied by skarn minerals (garnet, diopside, epidote, phlogopite) and beryl. The main ore mineral is cassiterite, accompanied by minor chalcopyrite, pyrrhotite, and pyrite, as well as scheelite. The tin ore grade varies with depth, with the highest grades (~1.2 % Sn) prevalent in the lower part of the vein zone. Muscovite 40Ar–39Ar dating yielded a plateau age of 82.7 ± 0.7 Ma which defines the age of the vein-type mineralization. Measured sulfur isotope compositions (δ 34S = −4.1 to 3.9 ‰) of the sulfides (arsenopyrite, chalcopyrite, pyrite, and pyrrhotite) indicate that the sulfur in veins is mainly derived from a magmatic source. The sulfur isotope values of the ores are consistent with those from the underlying granite (Laochang equigranular granite, −3.7 to 0.1 ‰) but are different from the carbonate wall rocks of the Gejiu Formation (7.1 to 11.1 ‰). The calculated and measured oxygen and hydrogen isotope compositions of the ore-forming fluids (δ 18OH2O = −2.4 to 5.5 ‰, δD = −86 to −77 ‰) suggest an initially magmatic fluid which gradually evolved towards meteoric water during tin mineralization. The online version of this article (doi: 10.1007/s00126-012-0409-4) contains supplementary material, which is available to authorized users. Prof. Franco Pirajno is thanked for valuable discussions during the field trip. Prof. Peter Laznicka is thanked for detailed language polishing and constructive scientific comments, which greatly improved the quality of this manuscript. Mr. Guopei Mo, Mr. Xiang Tong, Mr. Junde Wu, and many other geo-workers from the Yunnan Tin Group provided invaluable assistance during our field work, which is highly appreciated. Xiaolong Li and Juan Zhang from China University of Geosciences (Beijing) are thanked for their help with some laboratory work. This study was supported by the National Science Foundation of China (40930419), Special Research Funding for the Public Benefit Sponsored by MLR (200911007-12), Research Program of the Yunnan Tin Group (2010-04A), Geological Survey of China Project (1212011120994), and the Fundamental Research Fund for the Central Universities (2-9-2010-21).